Abstract | Biotic and abiotic stresses adversely upset plant growth and development via nutrient deficiencies, hormonal imbalances, ion toxicity as well as osmotic and oxidative anxiety. The most effective mechanism is the biosynthesis of secondary metabolites at cellular level which included organic compounds that help plants to cope with stress conditions by reducing the intensity of stress through enhancing antioxidants activities, detoxifying toxic ions, regulating the uptake of nutrients and by mediating the transport and distribution of different hormones. Caffeic acid is actively involved in plant physiology and mechanisms of stress tolerance primarily utilized by plants for the synthesis of lignin which ultimately thickened cell walls and plant become resistant to ion toxicity sodium and heavy metal stress. It also reconciles the absorption of high energy radiations in mesophyll cells under drought stress, mechanism involves the production of ferulic acid through the methylation of caffeic acid catalyzed by O-methyltransferase. It has been concluded that exogenous application of cafeic acid may be a best option to cope with salinity, ion toxicity, drought and heavy metal stress. Citation | Riaz, U., M.A. Kharal, G. Murtaza, Q. Zaman, S. Javaid, H.A. Malik, H. Aziz and Z. Abbas. 2019. Prospective roles and mechanisms of caffeic acid in counter plant stress: A mini review. 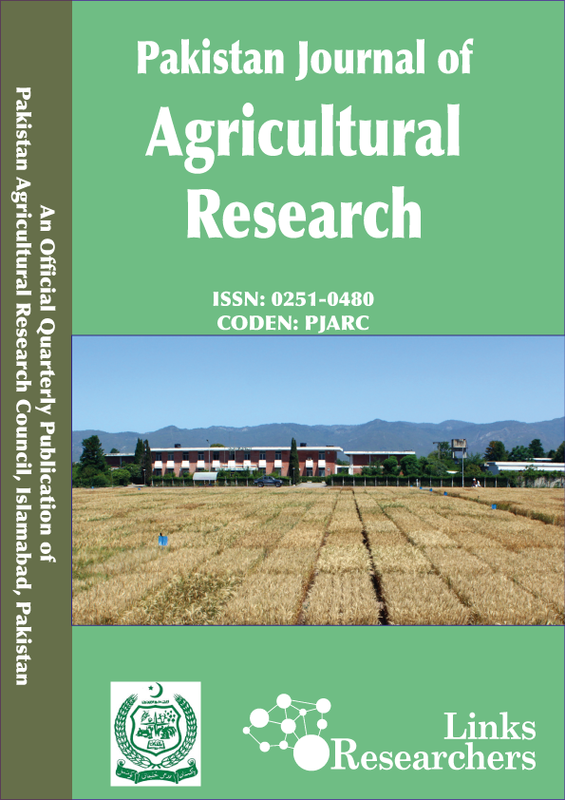 Pakistan Journal of Agricultural Research, 32(1): 8-19. In response to external environmental variations plants developed a strong mechanism of action that enables them to with stand against the abrupt environmental conditions. This mechanism of action involves the synthesis of a number of secondary metabolites. These metabolites help plants to regulate their internal environment and support them to acclimatize with the changing external environmental conditions. These secondary metabolites are derived from plant biosynthetic pathways and either act at site of synthesis or transported to other parts in the plant’s body. To adapt stress tolerance, production of these organic metabolites is a primary tool for plants to mediate a wide range of adaptive response systems as these metabolites are involved in the regulation of plant growth, development and plant’s response to the adverse effect of stresses (Kaya et al., 2007; Santner and Estelle, 2009). The most important secondary metabolites synthesized by plants are phenolic compounds including phenylpropanoid and flavonoids. The chemical classification of the phenolic compounds is shown in (Figure 1). The phenylpropanoid are important from plant stress tolerance point of view due to their role in the preservation of plant’s metabolic machinery and ultrastructure from stress induced oxidative alterations (Dixon and Paiva, 1995; Mayer et al., 2001). Caffeic acid (3, 4-dihydroxycinnamic acid) is a cinnamic acid and considered as an important phenylpropanoid found in plants. The chemical structure of the main cinnamic acids is depicted in the (Figure 2). Caffeic acid is primarily involved in the synthesis of lignin. In addition, it is also involved in the regulation of cell expansion, turgor pressure, phototropism, water flux, and growth (Lattanzio et al., 2006). It is being also widely studied for its pharmacological aspect for human health. Caffeic acid, and its derivatives, are evidently known to be involved in plant biotic and abiotic stress tolerance including pathogen attacks, low and high temperature stress, UV light, drought, heavy metal stress and salinity stress (Douglas, 1996; Martinez, 2012). For example, Martinez et al. (2012) reported that under fungal attack the higher accumulation of caffeic acid results in prevention of brown rot i.e. a fungal disease. Barkai-Golan (2001) also reported that the higher accumulation of caffeic acid enhanced disease resistance in apple by inhibiting the activity of pathogens. The studies also showed that the exogenous application of caffeic acid resulted in significant enhancement of plant disease resistance as Davidson, (1997) reported that the application of 500 µg mL-1 of caffeic acid resulted in inhibited growth of a number of Fusarium and Saccharomyces species. The literature also showed that under abiotic stresses, tolerant plants show higher accumulation of caffeic acid (Bubna et al., 2011; Klein et al., 2013; Klein et al., 2015). Under salinity stress higher concentration of caffeic acid results in increased salt tolerance in plants (Jamalian et al., 2013). From the literature survey it was revealed that caffeic acid also improves plant growth under drought stress and heavy metal toxicity through enhancing antioxidant activity (Rivero et al., 2001). It enhances plant stress resistance mainly due to its strong antioxidant activity and the regulation of antioxidant enzymes. It is the most abundant phenolic acid in plants involved in the scavenging of reactive oxygen species (ROS) and free radicals (Gutteridge, 1995; Siquet et al., 2006). Caffeic acid is an important plant secondary metabolite widely distributed in animal kingdom. Keeping in view the importance of caffeic acid for plant growth regulation present review is focused on the role of caffeic acid in plants, its biosynthesis, metabolism and its involvement in plant stress management under biotic and abiotic stresses. Caffeic acid (CA) is a phenolic compound and classified as phenyl propanoid hydroxyl cinnamic acid. It is synthesized by all plants and a primary precursor for lignin synthesis in plants. It is a principal intermediate in phenylpropanoid pathway synthesized from phenylalanine or L-tyrosine (Hüner and Hopkins, 2008). In most cases, caffeic acid is synthesized from phenylalanine. In first step, phenylalanine is converted into cinnamate catalyzed by phenylalanine ammonia-lyase (PAL) enzyme (Achnine et al., 2004; Vanholme et al., 2010). Different other byproducts are also produced by the hydroxylation, methylation, and dehydration reactions that enable plants to regulate its internal physiology under stresses as a prominent example is salicylic acid. In second step, cinnamate 4-Hydroxylase (C4H) further hydrolyzes the cinnamateto p-coumarate. In some plants and microbes p-coumarate can also be synthesized directly from L-tyrosine in the presence of tyrosine ammonia-lyase (TAL) enzyme (Lewis and Yamamoto, 1990; Rippert et al., 2009). The enzymes involved in this process are thought to present in cytoplasm in the vicinity of endoplasmic reticulum (Ro et al., 2001). p-coumarate than finally converted into caffeic acid through hydroxylation. This caffeic acid is primarily future utilized for the synthesis of lignin or some other secondary metabolites involved in plant stress tolerance (Dixon and Paiva, 1995; Ro et al., 2001; Vanholme et al., 2010). 1. O-methyltransferase transfers the methyl group to caffeic acid and converts it into ferulic acid (Koshiro et al., 2007). 2. CoA ligase catalyzes the formation of feruloyl-CoA from ferulic acid (Obel and Scheller, 2000). 3. CoA ligase also incorporates CoA in caffeic acid and produces caffeoyl-CoA (Campa et al., 2003). 4. The addition of quinic acid in caffeic acid results in chlorogenic acid (Dixon and Paiva, 1995). 5. The esterification of caffeic acid results in rosmarinic acid (Roy and Mukhopadhyay, 2012). 6. Caffeic acid also been converted to cichoric acid in plants (Butiuc-Keul et al., 2012). 7. Caffeic acid primarily utilized by plants for the synthesis of lignin (Dixon and Paiva, 1995). 8. The successive methylation of caffeic acid results in the formation of sinaptic acid (Laranjinha, 2002). A number of environmental variations including salt stress (Jamalian et al., 2013), wounding (Dixon and Paiva, 1995), drought, osmotic (Król et al., 2014) UV radiations (Dixon and Paiva, 1995) and exposure to pathogens and disease-causing agents induce the caffeic acid signaling in plants. Caffeic acid results in the switching of production of various caffeic acid derivatives and related compounds under the attack of insects, pathogens and abiotic factors like high intensity light, temperature etc. (Król et al., 2014). Under osmotic stresses the reduction in water contents results in the production of several phenolic compounds among them caffeic acid and its derivatives are common including salicylic acid, chlorogenic acid etc. (Gilmour et al., 2000). The primary function performed by these metabolites is the scavenging of ROS and free radicals that protect plants from oxidative disintegration (Amarowicz and Weidner, 2009). Under salinity and heavy metal stress the uptake of toxic ions also enhances the production of caffeic acid (Dixon and Paiva, 1995). Caffeic acid induces the production of its other derivatives (especially, rosmarinic acid) that neutralize the effect of toxic and notorious ions in cytoplasm. Caffeic acid forms complexes with the heavy metals and toxic ions, which catalyze the oxygenation reactions and restrict the activity of oxidizing enzymes (Elavarthi and Martin, 2010). Caffeic acid is considered to activate the redox-active Nrf2 signaling pathway. The literature shows that, under stress conditions augmented transcription of genes encryption conform the biosynthesis of specific enzymes that induce the production of dihydroxy cinnamic acid (caffeic acid). (Kneusel et al., 1989) purposed a hydroxylase that is highly sensitive to pH is assumed to be sedentary under normal pH conditions. While under stress conditions e.g. pathogenic attack sudden drop in cytoplasmic pH results in the activation of genes that transcript the specific proteins for the synthesis of enzymes that catalyze the biosynthesis of caffeic acid and its derivatives (e.g. ferulic acid and caffeoyl-CoA). The increased biosynthesis of enzymes for phenylpropanoid pathway and pathways of cinnamic acid synthesis, induce the phytoalexin reaction in plant due to external adverse biotic factors (Dixon and Paiva, 1995; Hahlbrock et al., 1995). The velocity of stress induced biosynthesis of proteins, varies among plant species as in some plants the action of genes related to transcription of phenylalanine ammonia-lyase is extremely quick and well organized. While in some plants the signaling is not much organized and prompts indicating the contribution of several signals for stimulation of the pathway (Hahlbrock et al., 1995; Lawton and Lamb, 1987). Despite of biotechnological advances in genes identification and transcriptional processes, the information about the caffeic acid signaling in plants is quite rare. Stress conditions alter plant’s physiological processes, due to these changes large amount of reactive oxygen species (ROS) are produced (Parvaiz and Satyawati, 2008). These ROS are highly reactive and are harmful for plant membranes and organelles. ROS react with membranes and organelles, disintegrate and oxidize cell structures (Gao et al., 2008). Major ROS produced are; singlet oxygen, hydrogen peroxide, superoxide radicals and hydroxyl radicals (Foyer and Noctor, 2003; Halliwell, 2006; Triantaphylidès et al., 2008). The main sources of ROS are chloroplasts and mitochondria that have high energy activities and deal with high flow of electrons (Gill and Tuteja, 2010b; Mittler, 2002). In response to these ROS, plant evolved a mechanism to denature these harmful ROS. The mechanism involves the production of different antioxidants, which are enzymatic and non-enzymtic. The phenolic compounds, alkaloids, non-protein amino acids and phenylpropanoids are major non-enzymatic antioxidants (Gill and Tuteja, 2010a) Several studies revealed that hydroxylcinnamates, especially caffeic acid, is critically play a vital in the regulation of antioxidant activity not only in plants but also extensively studied for their role as antioxidants in pharmacology. Dos-Santos et al. (2011) reported that caffeic acid rouse the antioxidant mechanism of plant and prevent membrane structures form being oxidized, by restricting the activity of lipoxygenase and prevents the membranes and organelles from lipid peroxidation. Caffeic acid and derivatives, including chlorogenic acid, ferulicacid, rosmarinic acid etc., are extensively distributed in plants. These are preforming their antioxidant activity by their hydrogen donating ability that enables them to stabilize and neutralize the free radical released due to disturbance in plant’s cellular physiology (Siquet et al., 2006). As, one of the most predominant phenolic compounds present in plants, caffeic acid can trap ROS directly or scavenge them through a series of coupled reactions with antioxidant enzymes. Caffeic acid also plays a vital role in the scavenging of alkoxy groups produced due to splitting of metal-ions in hydroperoxide enriched methyl linoleate (Milić et al., 1998). Sroka and Cisowski, (2003) also reported the antioxidant ability of caffeic acid, as the reaction between quinic acid and caffeic acid results in the synthesis of chlorogenic acid that is also a strong antioxidant and enhance stress tolerance by reducing hydrogen peroxide production and increasing DPPH radical-scavenging activities. Different researchers have evaluated the role of caffeic acid under different stresses. Some of the findings are discussed in the (Table 1). Under natural conditions a variety of pests and disease causing agents attack plants. Plant is a sessile organism so it needs to fight that factors while standing within its place. This is done by developing tolerance or resistance mechanism that allows plants to survive under these biotic stresses. As described earlier, stress regulation in plants is mainly done by the synthesis of several types of secondary metabolites within the cytoplasm. These secondary metabolites act as chemical barriers mechanisms that rapidly recover and inhibit the infections or localize or eliminate the pathogenic agent minimizing the damage to plants, as these secondary metabolites are toxic to the pests and disintegrate growth of pathogens. Hydroxycinnamic acids, caffeic aid and derivatives, are important phenolic compounds that are considered as important secondary metabolites actively involved in plant’s defense mechanism against biotic stress agents. The esters and glucosides of caffeic acid have unique antifungal properties as Davidson (1997) reported that application of caffeic acid (@500 µ mL-1) and chlorogenic acid (@ 1000 µ mL-1) resulted in significant inhibition of Fusarium growth. The pathogenic activity of Aspergillus flavuswas also significantly checked by the application of caffeic acid derived ferulic acid (Davidson, 1997). The mechanisms of action that activates caffeic acid antibiotic activity is proposed as when pathogenic lipolytic enzymes enter the plant cell in cytosol that inhibit the activity of pathogens. The enzymes produced, in response to caffeic acid accumulation, disintegrates the pathogen’s membranes and cause cell leakage. Furthermore, caffeic acid may directly inhibits the protein synthesis in pathogen cells (Osbourn, 1996; Davidson, 1997). As described previously, caffeic acid is a primary precursor of lignin in plants. Lignification is an important mechanism for biotic stress tolerance adopted by plants. Reports showed that different disease resistant plants show enhanced lignin production as compare to susceptible plants (Yedidia et al., 2003). A number of studies showed that under pathogen attack the accumulation of caffeic acid results in enhanced lignification resulting in increased resistance towards pathogens (Vance et al., 1980; Nicholson and Hammerschmidt, 1992; Sticher et al., 1997). As, Egea et al. (2001) demonstrated in 3 genotypes of pepper differed in their sensitivity to the infection of Phytophthora capsici (causing agent of blight). They concluded that the more the resistant variety more the accumulation of caffeic acid and its derivatives, resulting in increased activity of peroxidase and higher the lignin deposition. Table 1: Effect of endogenous accumulation of caffeic acid and its derivatives under stress conditions. The lignification is evident in form of thickened cell walls due to the deposition of lignin and increased concentration of peroxidases. Hammerschmidt, (1999) reported that the lignification of cell walls in epidermal cells induced disease resistance in cucurbits against the Colletotrichum orbiculare by preventing the entry of pathogens. The role of caffeic acid is also evident by the studies conducted by (Kruger et al., 2002). They concluded that the reduction in the production of caffeic acid reduced the thickness of cell wall leading to higher penetration of fungal pathogen in barley plants. The deposition of lignin also serves as a comprehensive strategy against mechanical and enzymatic disintegration of cell wall resulting in significant reduction in pathogens, insects, and herbivores attack. Furthermore, the thinking of cell wall also restricts the flow of metabolites and food between pathogen and host plant resulting in the starvation of pathogen (Lewis and Yamamoto, 1990; Sederoff et al., 1999; Davin and Lewis, 2000; Hatfield and Vermerris, 2001; Boerjan et al., 2003). Different secondary products from caffeic acid to lignin synthesis pose toxic effects on fungal agents and also alter the composition of cell walls of fungus making it more inflexible and impervious, thus hampering the uptake of moisture and nutrients (Lattanzio et al., 2006). It is evident from literature that caffeic acid is actively involved in plant biotic stress management and disease tolerance. Caffeic acid inhibits the activity of pathogens and prevents the development of different infectious diseases. The primary mechanism for caffeic acid mediated disease management in plants involves the inhibition of pathogen’s enzymatic machinery and through the lignification that prevents the entry of pathogenic agent into host plant cell. Effect of caffeic acid on mutualistic interactions: Soil inhabiting microorganisms play a significant role in plant growth and development through interacting plants by various mechanisms. A variety of soil microbes interact with plants including bacteria, fungi, actenomyctes etc. (Nadeem et al., 2014). However, the most important organism that interact with plants mutualisticaly are bacteria, which are present in the soil in largest diversity and quantity. The most important relationship between bacteria and plants is biological fixation of atmospheric nitrogen by the nitrogen fixing bacteria (Ahmad et al., 2014). Caffeic acid and its derivatives are known to improve the nitrogen fixation by enhancing the activity of nitrogenease and leghaemoglobin in root nodules (Dhir et al., 1992; Klein et al., 2015). Klein et al. (2015) reported that under stress conditions the application of caffeic acid significantly improved the activity of nitrogen fixing rhizobium, otherwise adversely affected. It is suggested that caffeic acid principally enhanced the antioxidant system that improved the activity of enzymes involved in nitrogen fixation and additionally this also elevate the proteins and total soluble carbohydrates concentration in nodules as reserve food materials (Dhir et al., 1992; Mur et al., 2013). On the other hand, arbuscular mycorrhizal (AM) association is also an important association the recent reports showed that caffeic acid is an important metabolite in AM association as (Toussaint et al., 2007) reported that when AM association is present in plant there is significant manipulation in caffeic acid concentration in plants body as compared to control indicating the role of caffeic acid in this association. However, there is very little literature is available on the role of caffeic acid in controlling plant mutualistic introductions but evidences are present that suggest a strong role of caffeic acid in plant microbe relations. As described earlier that plants have evolved a number of mechanisms to cope with external environmental disruptions or stresses. Plants produce different secondary metabolites to mediate internal environment in order to acclimatize the handicap situations. About 50-70% of loses in agricultural production are considered due to different abiotic stresses. All stresses onset disturbances in ionic and osmotic equilibrium. Caffeic acid is proven as a signaling molecule that stimulates plant defense responses under different environmental stresses enabling plants to with stand the harsh conditions (Wasternack, 2014). Caffeic acid offset salinity stress: Salinity stress is the one of the most damaging stresses affecting about 30% of the world agricultural production including all major food and cash crops. Under salinity stress due to high uptake of toxic ions (Na+ and Cl-) alteration of plant physiological processes occurs. The accumulation of excessive toxic ions leads to the production of ROS that disturb several vital metabolic processes including photosynthesis, respiration, cell division etc. These ROS, when produced in high concentration, severely damage the cell organelles, membrane structures and bio-molecules including RNA and DNA (Mittler, 2002). Caffeic acid is known as a strong antioxidant agent that modulates the production of ROS in plant cell (Bubna et al., 2011). In recent studies the role of caffeic acid in mitigating the adverse effect of salinity on plants is reported as (Klein et al., 2013) described that caffeic acid is actively associated with augmenting the scavenging ability of superoxide dismutase in detoxification superoxide radicals. Caffeic acid also protects cell organelles by preventing their membranes from lipid peroxidation by suppressing the activity of lipoxygenase (Gutteridge, 1995). The exogenous application of caffeic acid is proved as effective tool for inducing salinity tolerance in plants. It also known to improve nodulation under salinity stress. In a recent study it has been reported that salt induced reduction in nodulation was significantly ameliorated by the exogenous application of caffeic acid. Klein et al., (2015) suggested that mitigation of salinity stress on nodulation was due to caffeic acid induced nitric oxide biosynthesis which reduced the severity of stress through a mechanism that includes nitric oxide signaling coupled with cyclic guanosine monophosphate-mediated signaling to capture the ROS. They also concluded that exogenous application of caffeic acid also reduced the salinity induced oxidative stress by binding the superoxide radicals minimizing the cell death. Drought stress and caffeic acid: Crop productivity in many regions of the world is adversely affected due to shortage of good irrigation water (Riaz et al., 2018). Drought is a world-spread abiotic stress (HongBo et al., 2005). Decline in crop growth and productivity were reported when suffered from water deficit stress (Farooq et al., 2008). Yield losses in crops due to drought are perhaps more than the losses due to other abiotic causes. Decline in potential yield of various crops due to drought ranges between 54% and 82%. Every aspect of plant growth and yield was affected by drought because water is essential for every stage of plant from seed germination to plant maturation (Athar and Ashraf, 2005). Heavy metal stress and caffeic acid: Due to expanding industries and municipalities a major problem faced by the modern agriculture is the contamination of agricultural resources by heavy metals. These heavy metals are toxic substances that are harmful for all living thing and also for plants. Heavy metal stress is wide spread problem and is expanding rapidly with increasing population and growing industries. Plant growth is adversely affected by heavy metals, when up taken in excessive quantity. Higher accumulation of heavy metals in plants body results in restriction in growth, reduction in biomass and in severe cases death of plant (Michalak, 2006). These all attributed to the inhibition of several physiological processes including respiration, photosynthesis, cell elongation, plant-water relationship, nutrients metabolism and mineral nutrition (Zornoza et al., 2002). Caffeic acid brings about several anatomical alterations in response to different stressors including heavy metal stress. Diaz et al. (2001) suggested that under heavy metal stress the higher concentration of caffeic acid stimulates the production and accumulation of lignin in cell walls and increase its durability resulting in a physical obstacle avoiding damage to cells by damaging action of heavy metals. The other mechanism primarily involved in prevention of heavy metal stress is the antioxidant ability of caffeic acid and its derivatives. The most destructive consequence of heavy metal toxicity is the production of ROS in plant cells that disintegrates the cell structures. Toxic ions degrade the lipid membranes by liberating alkoxyl radicals which oxidize the lipid membranes and denature cell ultra-structure. Caffeic acid inhibits lipid peroxidation scavenging these alkoxyl radicals and prevent damage to cells and mitigate the heavy metal stress (Michalak, 2006). Present information available on caffeic acid indicates that it is an important plant metabolite and is an essential component of plants antioxidant mechanism. It is strongly suggested that caffeic acid and its derivatives regulate the plant defense responses against biotic and abiotic stress. Caffeic acid metabolism indicates that it is a key process in plants cells that is vital for normal functioning of several physiological processes in plant. However, a huge gap is present in many aspects for understanding the role of caffeic acid in plants stress management as well as plant physiology and biochemistry. The researchers are encouraged to take part in filling the gap that would defiantly helpful in enhancing food production and decreasing food security under changing global scenario. Muhammad Ali Kharal, Qamar uz Zaman and Zafar Abbas collected the data and Ghulam Murtaza gave the idea about manuscript. Umair Riaz and Sana Javaid technically improved the draft and prepared tables and figures. Hina Ahmed Malik prepared the references and Humera Aziz wrote discussion. Authors are thank full to reviewers for their valuable input and technically evaluation of manuscript. Ahmad, M., A.U. Rajapaksha, J.E. Lim, M. Zhang, N.B.D. Mohane, M. Vithanage, S.S. Lee and Y.S. Ok. 2014. Biochar as a sorbent for contaminant management in soil and water: A review. Chemosphere, 99: 19-33. Amarowicz, R. and S. Weidner. 2009. Biological activity of grapevine phenolic compounds, Grapevine Molecular Physiology and Biotechnology. Springer, pp. 389-405. Athar, H. and M. Ashraf. 2005. Photosynthesis under drought stress. Handb. Photosynth. 2: 793-804. Barkai, G.R. 2001. Postharvest diseases of fruits and vegetables: development and control. Elsevier. Butiuc-Keul, A., L. Momeu, C. Craciunas, C. Dobrota, S. Cuna and G. Balas. 2012. Physico-chemical and biological studies on water from Aries River (Romania). J. Environ. Manag. 95: S3-S8. Davidson, P.M. 1997. Chemical preservatives and natural antimicrobial compounds. In: Doyle, M.P., Beuchat, L.R. and Montville, T.J. (Eds.). Food Microbiology-Fundamentalsand Frontiers. Washington D.C., ASM Press: 520-556. Elavarthi, S. and B. Martin. 2010. Spectrophotometric assays for antioxidant enzymes in plants. Plant Stress Tolerance: Methods Protoc. 273-280. Gutteridge, J. 1995. Lipid peroxidation and antioxidants as biomarkers of tissue damage. Clin. Chem. 41: 1819-1828. Hongbo, S., L. ZongSuo and S. Ming An. 2005. Changes of anti- oxidative enzymes and MDA content under soil water deficits among 10 wheats (Triticum aestivum L.) genotypes at maturation stage. Colloids and Surfaces B: Biointerfaces. 45:7-13. Hüner, N. and W. Hopkins . 2008. Introduction to plant physiology. Wiley, New York. Jamalian, S., M. Gholami and M. Esna-Ashari. 2013. Abscisic acid-mediated leaf phenolic compounds, plant growth and yield is strawberry under different salt stress regimes. Theor. Exp. Plant Physiol. 25: 291-299. Koshiro, Y., M.C. Jackson, R. Katahira, M.L. Wang, C. Nagai and H. Ashihara. 2007. Biosynthesis of Chlorogenic Acids in Growing and Ripening Fruits of Coffea Arabica and Coffea canephora Plants. Z. Naturforsch. 62c: 731-742. Krishna, S. and K. Surinder. 2003. Effect of some phenolic compounds and light intensity on nodulation, chlorophyll content, proteins, total free amino acid content and yield of soybean (Glycine max (L.) Merrill). India. Agric. 47: 79-84. Laranjinha, J. 2002. Caffeic acid and related antioxidant compounds: Biochemical and cellular effects. Handb. Antioxid. Lattanzio, V., V.M. Lattanzio and A. Cardinali. 2006. Role of phenolics in the resistance mechanisms of plants against fungal pathogens and insects. Phytochem: Adv. Res. 661: 23-67. Martínez, J.A. 2012. Natural Fungicides Obtained from Plants, Fungicides for Plant and Animal Diseases, Dr. Dharumadurai Dhanasekaran (Ed. ), ISBN: 978-953-307-804-5. Michalak, A. 2006. Phenolic compounds and their antioxidant activity in plants growing under heavy metal stress. Pol. J. Environ. Stud. 15: 523. Mur, L.A.J., E. Prats, S. Pierre, M.A. Hall and K.H. Hebelstrup. 2013. Integrating nitric oxide into salicylic acid and jasmonic acid/ ethylene plant defense pathways. Front Plant Sci. 4: 215.